FQB "French Country" Collection blends all of the colours, flowers and vintage elements into one spectacular digital kit! 1 Breadboard in a worn wood look....baguette anyone?? 1 Vintage circle label element - "Francois Cafe..."
1 Vintage circle label element in red - "Vins & Spiritueux"
1 Frame cluster element with 2 smaller frames inside of a large, toile backed frame. Vintage French at its finest! 1 Grainsack - "Moulins de Nitwit...."
1 Grainsack - "Memories give us....."
4 Journal tags that are less adorned....sometimes less is more! 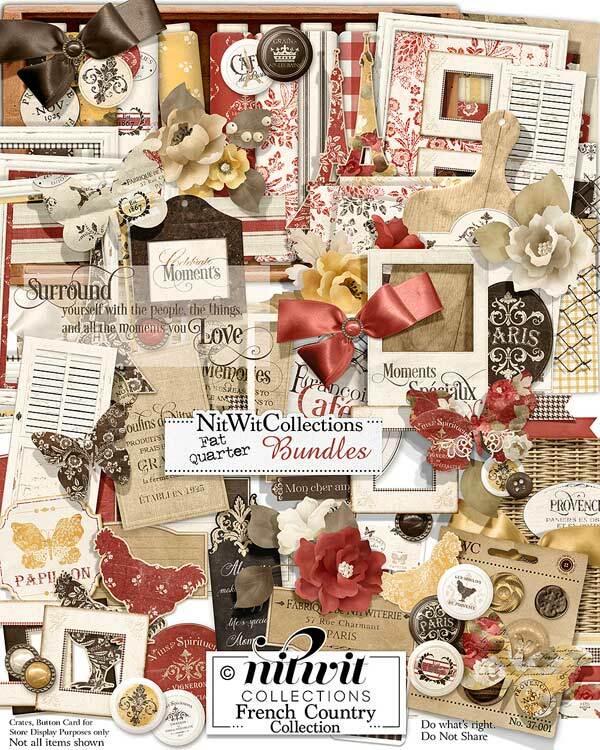 1 Vintage label - "Paris"
1 Vintage label - "Papillon"
1 Vintage label - "Fabrique de Nitwiterie..."
1 Sentiment digital stamp - "Surround yourself with the people..."
2 Vintage shutter digital elements....what interest and feel will you add to your creations with these? ?